Wow, who knew you could actually get REALLY good food on the Pier?!! After 35 years, the space formerly known as SM Pier Seafood has been totally reimagined as The Albright, a clean, simple, airy, Nantucket-y kinda place with an updated menu that uses fresh, locally sourced seafood and produce. The casual atmosphere is perfect for the Pier — simply place your order, take your number to one of the wood bench tables inside or out on the patio and a server will bring your food and drinks. I’ve been almost totally vegan the last four months, and I have to say that the fried fish tacos and wild-caught salmon with arugula pesto and brown rice were TOTALLY worth breaking vegan!!! Even the sangria was awesome (and so pretty). It was a beautiful day in the neighborhood and a total blast spending it with my girl Nicole who’s about to tie the knot next week!!! LOVEZ!!! I love the farris wheel but the food has always lacked at the pier. 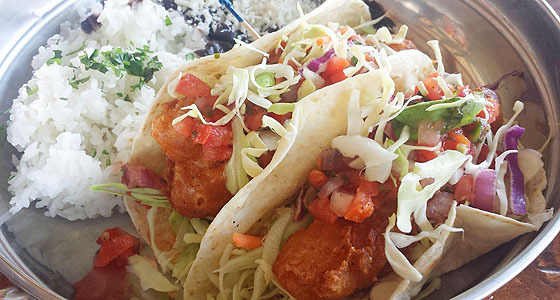 Bubba Gumps and Taco Bell do not qualify as edible. Thanks for the tip, I will try this next time I am there. Luvz! My new favorite place in SaMo! ← El Nosh Truck & Grammy Winners Pacific Mambo Orchestra!